The most important festival of the temple is “calling the mango”. On this Aani month (June-July) festival, Lord Shiva comes in procession as Bikshadana with his begging bowl, when devotees throw mango fruits standing at a higher level. Those seeking child boon catch them in their sari ends. 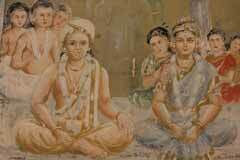 The event of Karaikal Ammayar reaching Kailash in Her ghost body is celebrated the next day. Lord Shiva, on this day will be outside the temple. The two hymns Rettai Mani Malai and Tiruvandadhi by Karaikal Ammayar would be recited. After the chanting, all the lights in the place would be put of. A torch near Lord Shiva and one near Ammaiyar would be lighted. The torch of Ammayar would be taken to that near Lord Shiva and put together marking the reaching of Ammayar to the Lotus Feet of Lord in a Jyoti form. 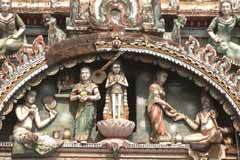 This festival is celebrated in Panguni (March-April) also. 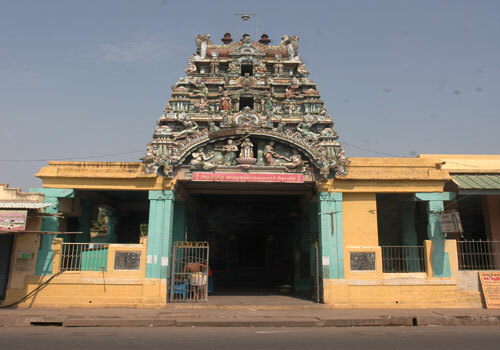 This is a temple for a Lord Shiva devotee – Karaikal Ammaiyar. Sri Karaikal Ammaiyar Temple, Karaikal – 609 602. Puducherry. +91- 4368 - 222 717. 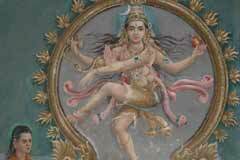 Sri Kamatchi Amman is believed to be powerful to grace Her devotees with help those facing problems in marriage proposals. Devotees perform Mango Naivedyam to Mother. When Paramadutta came home for lunch, Punithavati served him the remaining fruit. As it was so sweet, the husband asked for the other one also. 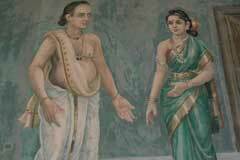 Punithavati was in a dilemma and begged the Lord to help her. A mango fell at her hands which she served to her husband. The second mango was sweeter than the first one. He asked his wife what happened and she told him the truth. When her husband demanded her to get one more through Lord Shiva, she prayed and to the surprise of Paramadutta, a fruit appeared on Punitavati’s hand. 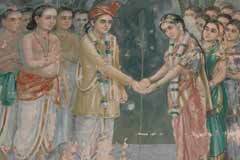 Paramadutta understood that Punitavati was divine and that he could not be a husband to her. He parted with her. He left for other place, married another girl and got a child through her. He named the child Punithavati. Knowing the development, Punithavati came to Paramadutta to call him back to her. He simply fell at her feet respecting her divinity. 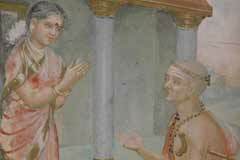 Punithavatiar prayed to Shiva to grant her old age and shed her youthfulness. She heard a voice directing her to proceed to “Kailash”. As Kailash is a sacred place, Punithavathiar walked the way by head. 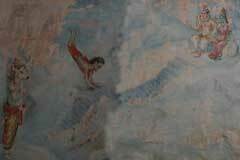 Lord Shiva came to receive her saying “Have you come safely” and granted her His dance darshan. 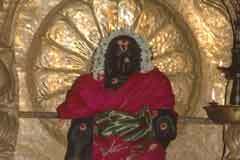 The temple was built later in her birth place, Karaikal. The temple is 1 km from Karaikal bus stand.